The National Appliance Energy Conservation Act better known as NAECA will mandate that any residential water heaters built on or after April 16th, 2015 must adhere to the new energy efficiency standards. Any products built before that date may be sold or installed after the effective date. 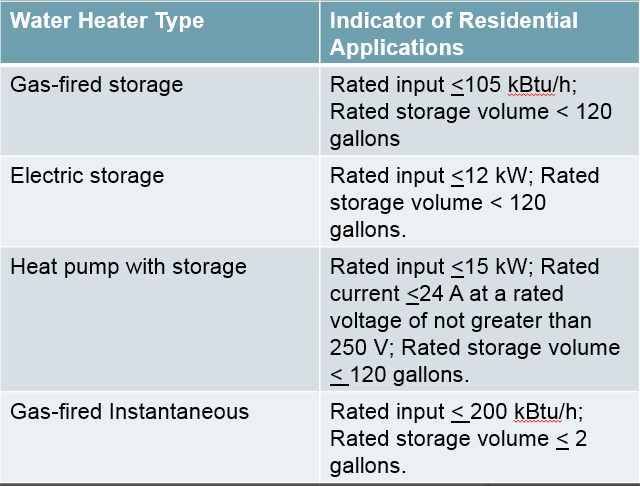 The chart shows the NAECA guidelines for both electric and gas residential water heaters. For electric residential water heaters 50 gallons and under HTP will meet the new energy efficiency guidelines with modifications to our existing products. While all of the major water heater manufacturers expect to increase the size of their units to meet these new guidelines, HTP does not anticipate needing to increase the existing dimensions of our units. For units over 55 gallons all electric products that meet the definition of “residential” will need to move to heat pump technology to meet the new standards. After July 13th 2015 when the new universal energy efficiency descriptor and test protocols take effect HTP intends to offer modified 80, 100 and 115 gallon units. The new models will maintain their existing (same as today’s) dimensions without heat pump technology and will be rated as commercial units which do not need to meet the new NAECA regulations. Most water heater manufacturers will need to increase the size, weight and price of their appliances to meet the new NAECA regulations. HTP has always met the stringent standards of efficiency and will not require extensive changes to meet regulations. Our appliances will continue to perform as they have in the past! Moving forward, HTP's innovative heating systems will continue to strive for higher efficiencies, leaving our products as leaders in the industry. To learn more about how the NAECA will affect our products, click here.